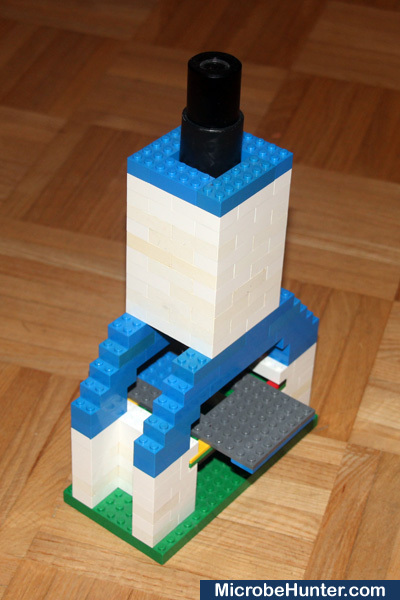 A simple, yet functional, LEGO microscope can be easily made using standard LEGO parts. The microscope that I present here magnifies 100x, can be focused, and has a stage that can be moved in two directions. 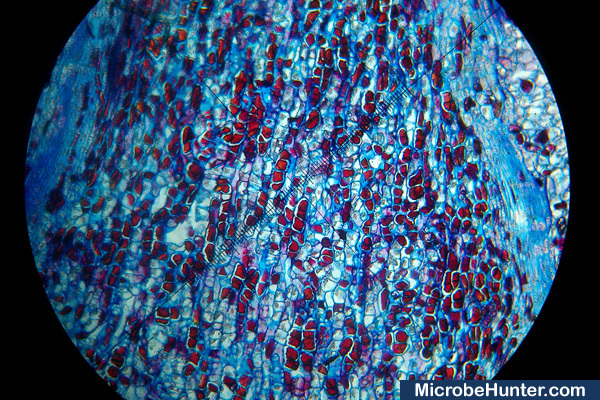 The microscope does not have a condenser, but it should not be too difficult to add one to improve image quality. 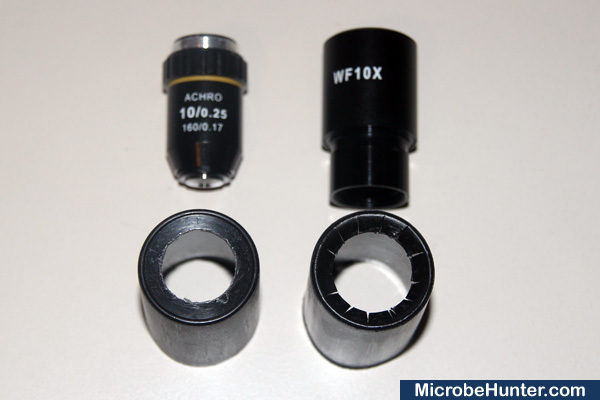 The microscope uses a standard DIN 10x objective and a 10x eyepiece. Two plastic film containers (canisters) serve as adapters. These containers can slide in and out of the microscope in order to focus the image. I have also tried to make a separate objective adapter from plywood, with LEGO bricks glued to the plywood using a glue gun. Using film containers, however, is easier. There is much freedom in constructing the microscope, as long as the objective to eyepiece distance is approximately 160mm. 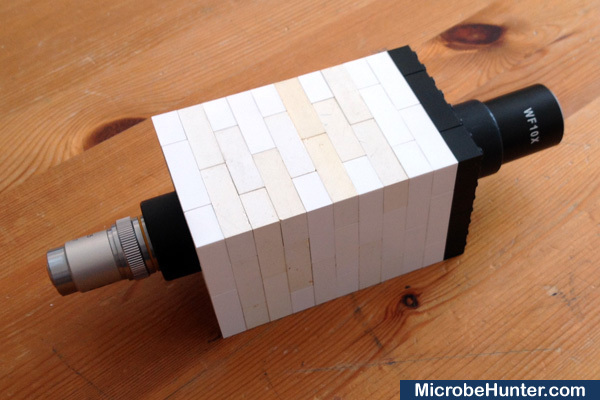 Making a microscope out of LEGO is not a new idea. There are websites, which describe the making of objective adapters using a 3D printer. I think that the use of empty film containers is probably the easiest solution, one which also makes the project more feasible for educational and school use. I generally prefer readily available parts over custom-made components. 10x achromatic DIN objective (these have the value 160 written on them). A 4x objective also works. Any magnification higher than 10x would decrease the working distance too much and would make focusing too difficult. 19mm drill (for wood) or sharp knife. Using the 19mm diameter drill (for wood), drill a hole on the bottom of the two plastic film cartridges. Carefully sand the edges to remove sharp corners and then remove the plastic dust. Now, the 19mm drill was not that cheap. You might want to try to use a sharp cutting knife to cut out a circle of about 18mm and then use sand paper to round of the hole. It goes without saying, that this is more time consuming, and increase the chances of injury. I have not tried it, but maybe it is also possible to use hot needles (to melt the plastic) to “puncture out” a circle first to make the cutting easier. In any case, the hole has to be quite tight to securely hold the objective. After all, the plastic is quite thin and has no threading. The metal threading of the objective will cut into the plastic container and this requires some patience. Some microscope objectives are shipped in a hard plastic container. The objective is screwed into the cap of this container. It is possible to also make use of the fact that this cap has a threading. Drill a hole into the cap and then glue the cap to the film cartridge. You can also make an adapter using plywood, but this method does not allow for focusing by moving the objective, so the focus must be adjusted only by moving the eyepiece. This is a disadvantage, because a larger focus travel is then necessary. Also drill a 19mm hole into the second film container. The diameter of this hole is not large enough to accept the eyepiece of 23 mm. Using a sharp knife, make several cuts (10 to 15) from the center of the hole towards the sides of the container. Using your thumb, press the plastic inwards. The eyepiece can then be inserted. Be aware, that some eyepieces have a rim. These eyepieces can then not be easily removed anymore. You then have to screw apart the eyepiece or cut apart the whole container. This is because the inward pointing plastic teeth act like hooks that hold the eyepiece in place at the rim and prevent the removal of the eyepiece. Actually this is even an advantage, because it increases the stability of the system. The original purpose of this rim is to fix the eyepiece into the tube of the microscope with a screw, so that it can not be removed (so-called “student proofed” microscopes have these eyepieces, so that they can not be stolen). 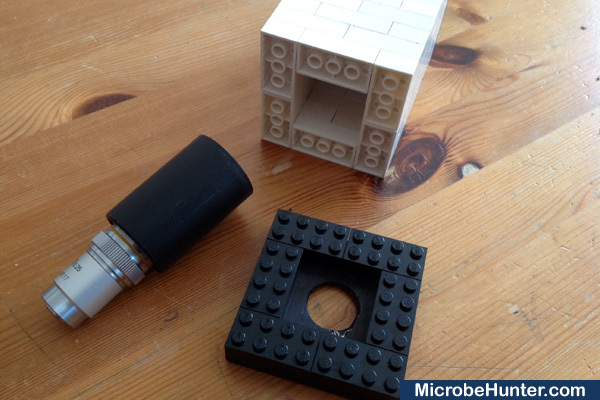 Use conventional 8 by 2 LEGO bricks to build the microscope. You can also use other bricks, of course. Dark bricks may reduce the internal light reflection in side of the tube, but I found white ones to work fine as well. Start building a square tube. Overlap the bricks to give the tube more stability. Build about 12 rows of bricks. Step 3: Insert the adapters. The adapters can now be inserted at either side of the tube. To do this, you have to squeeze the cartridges together a bit. The friction will then retain the cartridge inside the tube, while still allowing it to slide in and out. Some film cartridges are a bit thicker at the opening. This rim increases the friction between the cartridge and the tube of the microscope. Other cartridges are smooth and therefore slide in and out of the tube more easily, allowing for easier focusing. Moving the eyepiece in and out of the tube. The eyepiece is more accessible than the objective, but needs a significantly longer focus travel. Once the focus is adjusted, however, it is sufficient only to focus using the eyepiece. The assembled tube. Focusing is possible by sliding the adapters (the film containers) in and out of the tube. Much personal freedom exists in the construction of the microscope. Make sure that you have enough space for the slide and a space to place a battery-operated LED lamp. Using flat LEGO pieces, I also constructed a stage, which allows for the moving of the slide into two directions. It is also possible to drill a hole into a flat piece or, if you want to avoid the destroying of bricks to assemble several flat pieces to make a stage with a hole. In any case, there should be enough space beneath the stage for the lamp. It is possible to mount a single bright LED lamp on a brick and supply it with electricity over a cable. You need to connect a resistor in series, however. 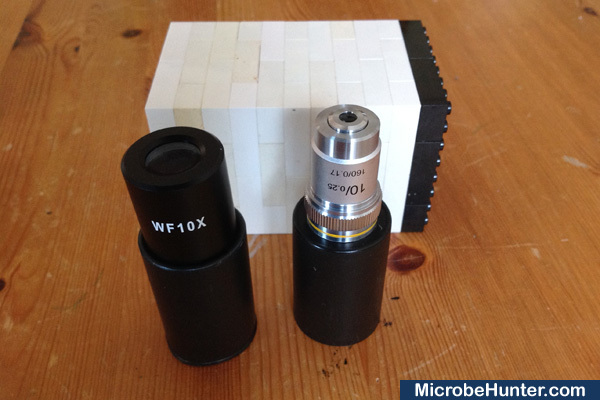 It is also possible to directly connect a microscope camera (with built-in reduction optics) instead of the eyepiece. You can also construct an adapter to hold a mobile phone camera. Last, it is possible to use flat bricks to construct baffles which extend inwards into the tube. These baffles decrease light reflections inside the tube and therefore increase the contrast. I have also lined the inside of the tube with black corrugated cardboard to decrease reflections, but found the effect to be irrelevant, as the shiny cardboard reflected at least as much light than the LEGO bricks of the tube. The most significant advantage would be the connection of a condenser, but I still have to find a convenient way of doing this. The images were taken with a mobile phone camera. The image contrast is slightly lower than on my “real” microscope, what I attribute to the missing condenser and possible internal tube reflections. The light of one single bright LED is enough, however, to illuminate the whole field of view. Pine flower cross section through the LEGO microscope. Dandelion cross section through the LEGO microscope. ● Cheap. I ordered the optics over EBay and got the cheapest ones available. ● Educational. 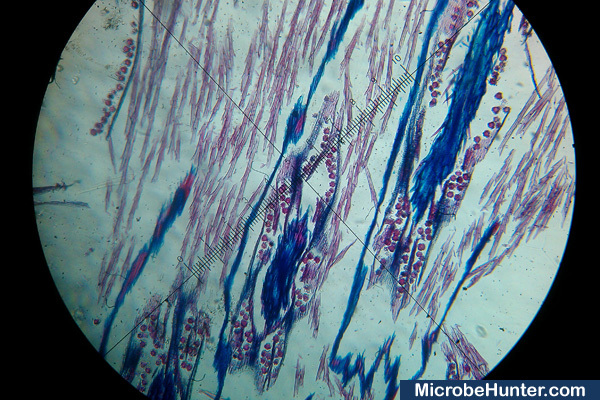 Helps students understand the principles of microscopy, if you want to use it as a school project. ● Works significantly better than pure toy microscopes.